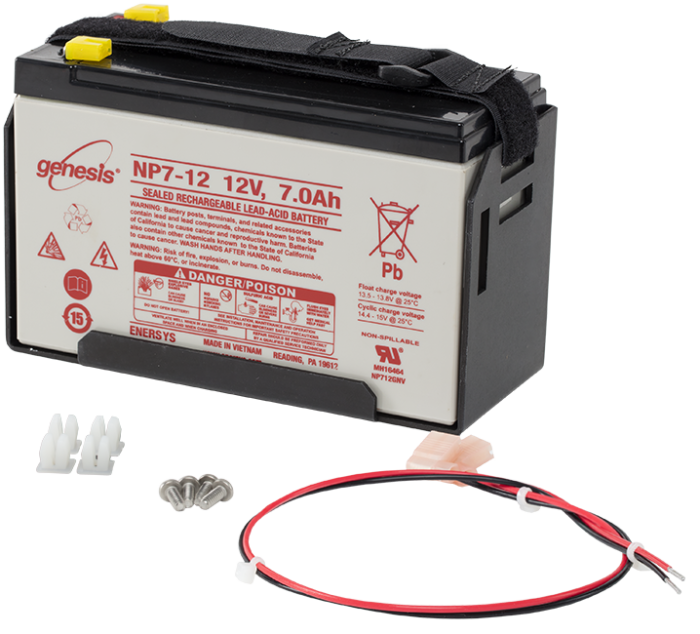 The BP7 is a 12 Vdc, 7 Ah rechargeable battery typically used with a CR6 or CR300-series datalogger. It consists of a sealed rechargeable battery, battery cable, and a mounting bracket. The cable terminates in stripped and tinned leads that attach to the onboard regulator of your CR6 or CR300-series datalogger. You can use the bracket to secure the battery to an enclosure backplate in either a vertical or horizontal position. A BP7 mounted vertically fits under the 31143 Hinged Stack Bracket. You can house the BP7 in any standard environmental enclosure. The 17374 cable terminates in pigtails that attach to the data logger's terminal strip or the MorningStar regulator (a component of the 25295 power supply). When used with the CR200(X) series, remember that the 17365 is too large for the ENC200 enclosure. It can be housed in any of our standard environmental enclosures (for example, ENC10/12, ENC12/14). The PS150 and PS200 are the preferred 7 Ah power supplies for the CR800, CR850, and CR1000X dataloggers. The BP7 can be used instead of the PS150 or PS200 when the battery needs to be mounted under the 31143 Hinged Stack Bracket. Neither the PS150 nor PS200 fit under the stack bracket. To use the BP7 to power a CR800, CR850, or CR1000X, purchase the 22024 cable and either the CH150 or CH200 regulator. The 22024 cable terminates in a connector that attaches to the CH150 or CH200. The BP7 is often used with data loggers that include their own charging regulators, such as the CR200(X)-series and CR6. It is also used with the 25295 PWS100 Power Supply. The BP7 requires a desiccated, non-condensing environment; a Campbell Scientific enclosure is recommended. If a fully charged 17365 battery is used without a wall charger or solar panel, how long will the 17365 continue to supply power to a data logger? This depends on the current drain of the system. For more information, see the “Power Supplies” application note.